With livelooping sounds made by an instrument can be layered, altered, mixed and edited as the music is performed. 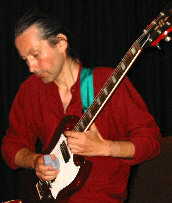 andy butler produces a wide range of sounds from his guitar by use of special techniques, and by electronic modification. Melodies, beats, bass and a whole range of distinctive guitar and 'non-guitar' tones. Scroll down for CD purchase (and more). 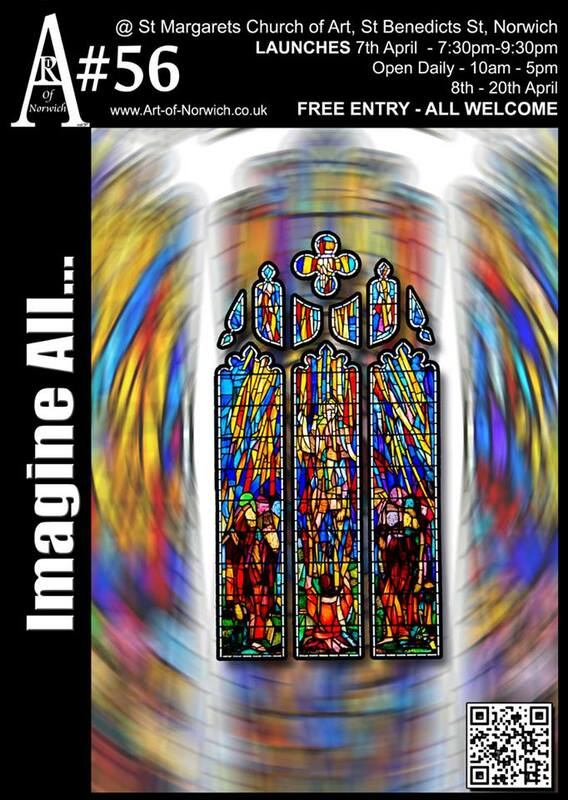 Art of Norwich 56 - "Imagine All..."
With hallucinated livelooping from andy butler at the launch. Watch out for more livelooping at St Margarets - The Church of Art, St Benedicts Street, Norwich. I often play livelooping sets at public views. 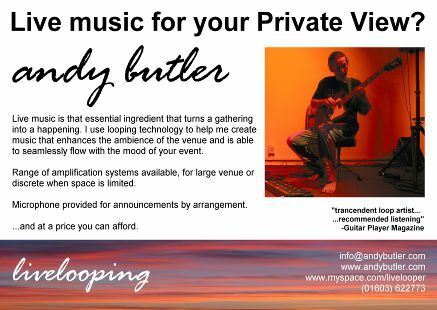 VIDEO FOOTAGE andy butler playing alongside the art at a previous event. ...and it's always worth dropping in to check out the art, regardless of whether there's loops running. Available for hire, with high quality pa systems capable of dealing with events up to about 300 attendees, or of being as discrete as an acoustic instrument. Or looking for something different, I'm now able to present a 15-16th Century music on the renaissance lute, and/or Eastern inspired improvisations on Turkish Saz. with mp3s, pics and videos of some of the best international looping artists. 11 tracks of looped guitar, each exploring a different possibility, and each a single unedited performance. Angular melodies, world-beat rhythms, lush chords in classical type harmony, trance sequences, abstract electronica, all woven into a cohesive album of compelling music. 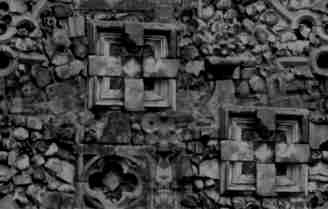 listen to a playlist of excerpts from the album, should work on Windows Media Player, Winamp and i-Tunes. Find Out More about the CD (and listen to excerpts). Credit card transaction handled by Paypal, or use your paypal account. email me if you'd like to send payment by post. With an otherwise unavailable andy butler track, this contains a wide selection of looping styles from around the world. High spots include multi-tracked cello from Zoe Keating, lofi dub beats with Ghost 7 and spaced out guitar strangeness from Krispen Hartung. backwater(3.4M), the first track from the livelooping cd, available free for personal use, and to share with friends. live recordings and more ....enjoy. Guitar Player Magazine has an article on looping in it's April 2006 edition. For those who like to know. I'm using a stereo pair of Gibson Digital Echoplexes as well as a Looperlative LP1 to recycle and re-edit my sound. The guitar sound is DI'ed through a Joyo Actone analog pre-amp simulator and modified through a Lexicon Vortex (see Vortex database). I run this rig directly to the pa, which by preference is my pair of JBL Eon15 powered speakers for a fantastically detailed and rich sound. Currently I'm also using an EH Octave Multiplexer for basslines, and a varying selection of stomp boxes for 'extra interest'. The guitar's a vintage SG copy by Hofner, with my own customisations, which include an onboard distortion with unusual sonic properties. I get those long sustained notes using a device called an Ebow. Many thanks to inventor Matthias Grob for programming some of my special effect suggestions into the Echoplex. A vst emulation of the Gibson Echoplex Digital Pro (EDP) is now available from Mathons. Created by my business partner at Mathons, Matthias Grob (the inventor of the original hardware). 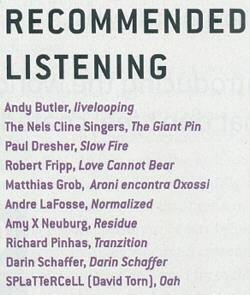 CT-ReUse is a cd project by members of the Chain Tape Collective. Available for free download as mp3. CT-Bugs is a cd project by members of the Chain Tape Collective. Available for free download as mp3, or buy a high quality cd here for the cost of manufacture. Interestingly, my track from this has been played on Swedish radio already. 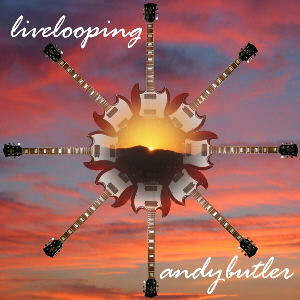 www.livelooping.org is a website totally devoted to live looping. Artists, gear reviews, forum, news, audio etc. 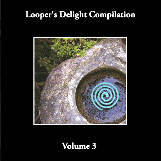 If you're a musician wanting to find out about looping go to www.loopersdelight.com. Join the mailing list and you could find yourself part of an international community ( or just knowledgable about loops ). Vortex database. The Lexicon Vortex is an fx unit with unique capabilities, plenty of info here. Matthias Grob, inventor of the Echoplex Digital Pro, amazing looping guitarist and we program music software together as Mathons. Bernhard Wagner guitarist, looper, programmer, multi-media artist. Check out his 4th Night cd, which was mostly recorded in my loop studio. Stephen Scott Looping guitarist local to the Norwich area. Rick Walker, live looper, percussionist and, it seems, we're working together on a recording project. Nick Robinson, live looping guitarist from Sheffield, and origami genius. Chopitch, the pitch shifting, beat chopping vst plug-in. A beat remix tool, a 'drum enlarger', or a way to make a regular guitar sound exactly like a bass. Vortex database, not really a database any more, but full of useful info on the Lexicon Vortex. Now with 'less worse' graphic design.